Today's interview is with Vivian Mineker, a freelance illustrator with an adorable art style, and some fantastic answers to my questions! This interview was conducted last year so please excuse any inconsistencies, and I hope you enjoy finding out a little about Vivian, her ideas on art, and how she stays proactive. Thank you for taking the time to answer some of my questions, Vivian! Would you like to introduce yourself and what you do? 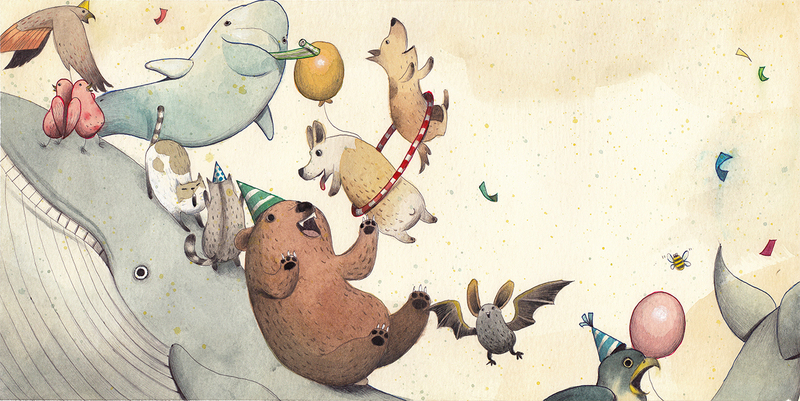 When did you first get into illustration? Is this something you’ve been formally trained in? Thank you very much for chatting with me, it’s a pleasure! I have been working as a freelance illustrator for about a year and a half, before that I was also in the creative field but in another capacity. I’ve done work as an illustrator before as a side business. As I built up my portfolio and clientele I decided to quit my job and do this full-time. I went to school for animation; a lot of the same principles and techniques from that applied to my illustration, so it was somewhat of a natural transition for me. I don’t quite recall my first illustration post, but I started pretty early on, just putting my work on social media, mainly for friends and family so they could see what I was working on. 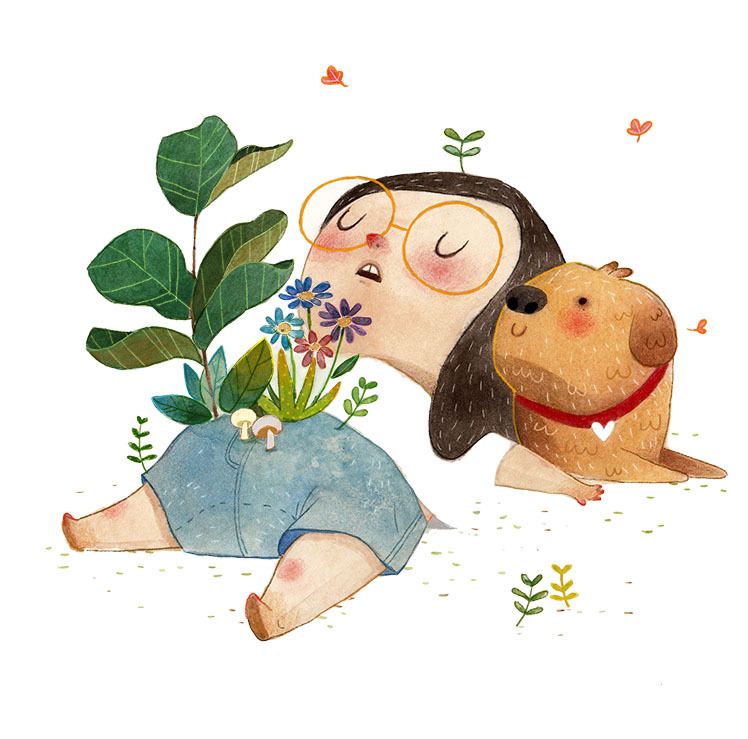 As more and more people discovered and liked my work I started a separate Instagram account just for my illustrations, as well as Tumblr and Behance accounts. The support I got from social media definitely helped me feel more confident, and also just knowing what people like was a tremendous resource for my growth as an artist. Yes! There has been so many extremely talented female artists who have influenced me over the years that I can’t name them all right now. 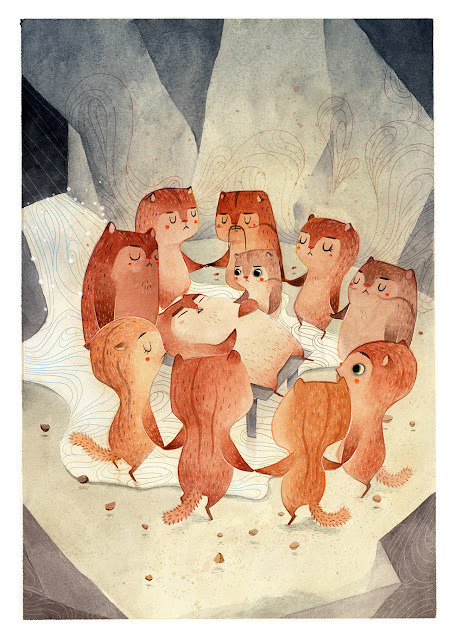 But I’m currently obsessing over Ira Sluyterman van Langeweyde (Iraville), Victo Ngai, and Cinta Vidal Agulló’s work. They constantly amaze me with the level of awesomeness of their work every time I look at them, I aspire to be on their level someday. Everybody check out their art! That is a tough one, I have several. 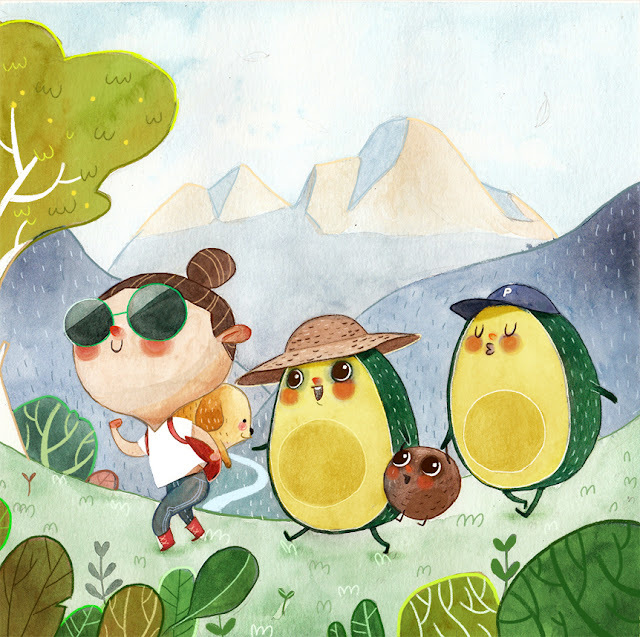 But if I have to pick one now it would be the one of the girl hiking with the avocado family (see bottom!). That one was particularly fun to draw and I just love avocados. I’m really happy that I was able to portray one avocado as a family of three! And also it just feels great every time I get to do a landscape scene and it turned out well. So I was travelling for about six months by myself not too long ago, and I discovered that I could draw and do work in a lot of different places and situations, as long as I was able to get a few specific things in place: a quiet corner where no one minds that I’m there for a long time, my art supplies (a few pencils, papers, and watercolor kit), a cup of coffee (preferably accompanied by some delicious dessert) and my phone for some music or a podcast (usually something nostalgic or relaxing, to get my mind into an easy place). Usually I’ll put on some music and take out my sketchbook and just clear my head and start drawing whatever comes to mind. This is kind of my palate cleanser, when I’ve been too caught up with work and deadlines, doing this help me clear my mind and get back into the creative zone. I think the most important thing is to just relax and let my artistic mind wander sometimes, without judgement or pressure of having to be productive all the time. I can’t live without my collection of pencils, colored pencils, and watercolor set. 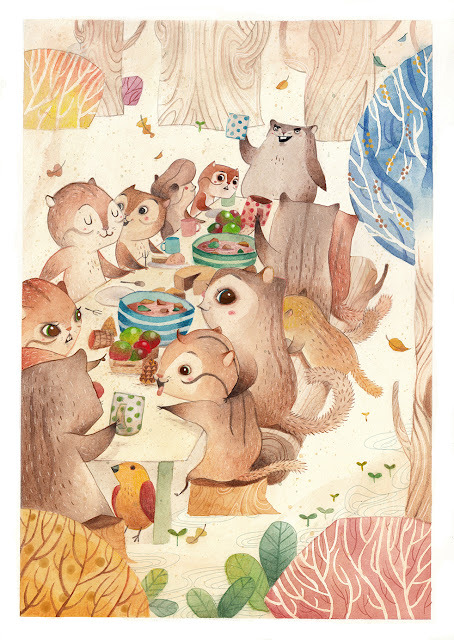 My work is quite mixed media, I usually create the base illustration on paper with watercolor and colored pencils, then finish the rest on digitally. My favorite step in this process is at the end when I’m finishing and polishing everything up in Photoshop, and it just all comes together. It’s very satisfying. As far as books go, I highly recommend The Book from the Society of Children's Book Writers; they have a large collection of resource to help illustrators of all levels with the business of working for yourself. I also recently discovered books on watercolor technique written by Billy Showell, which are very insightful and useful for any artist looking to advance their watercolor skills. I found social media to be very helpful as far as my confidence and insight to what people like. I have been fortunate enough to have majority of the responses of my work to be positive on social media; it’s been a great confidence booster as well as a source of motivation. However I still believe in finding business and building network the old fashion way - sending out postcards, calling publishers, going to book fairs etc. People appreciate the proactivity and it is always better to give a personal touch to every potential client. That being said, a few jobs I’ve had so far were direct results of my social media presence, so it is still a great resource to have, I just would not recommend relying on it as the only mean of getting work. Always work on a project. Doesn’t matter if it’s for a friend, a family member, an acquaintance, or just for yourself. Always work on something that you like and set goals. It will help you keep motivated, inspired, and get you drawing/painting everyday, and I think those are some of the most important things to keep in mind as an illustrator. I’m in the middle of reading the first book of the Remembrance of Earth's Past series - The Three-Body Problem; it’s a pretty mind blowing book, I’m loving it so far! I just recently watched Deliverance for the first time (gasp!) and it was great! Not the pick-me-up movie of the year for sure but I really enjoyed it. As far as music goes, I’ve been listening to a lot of The National lately, especially their most recent Trouble Will Find Me album, almost on repeat. Can’t wait for their new album coming out soon! Also I have to mention my love for the artist Adna, her music is amazing. I just want to thank you for all the wonderful questions, they were great and I really enjoyed chatting with you! There are several ways to follow my work, the most updated is definitely my Instagram @vivian.mineker. 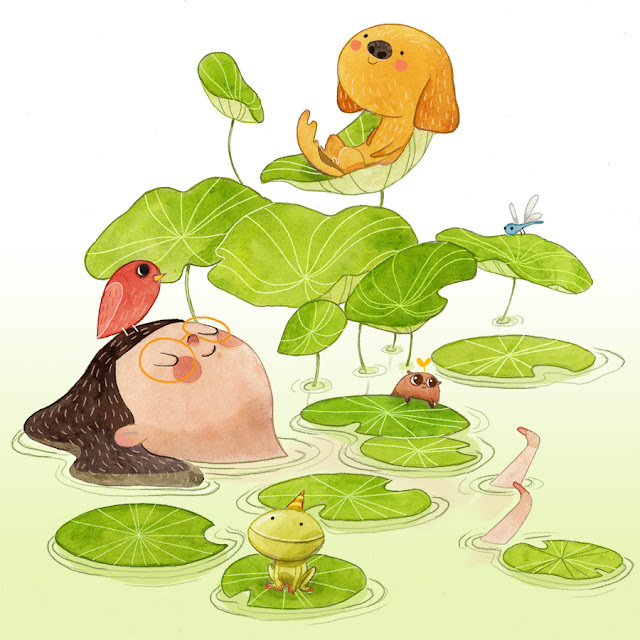 Also my website at VivianMineker.com, my Tumblr, and Behance. Again, thank you very much Megan, it’s been a pleasure! This is the tiniest of tiny coffee shops tucked away in a side street in Kreuzberg (cue Bloc Party), potentially my favourite district. 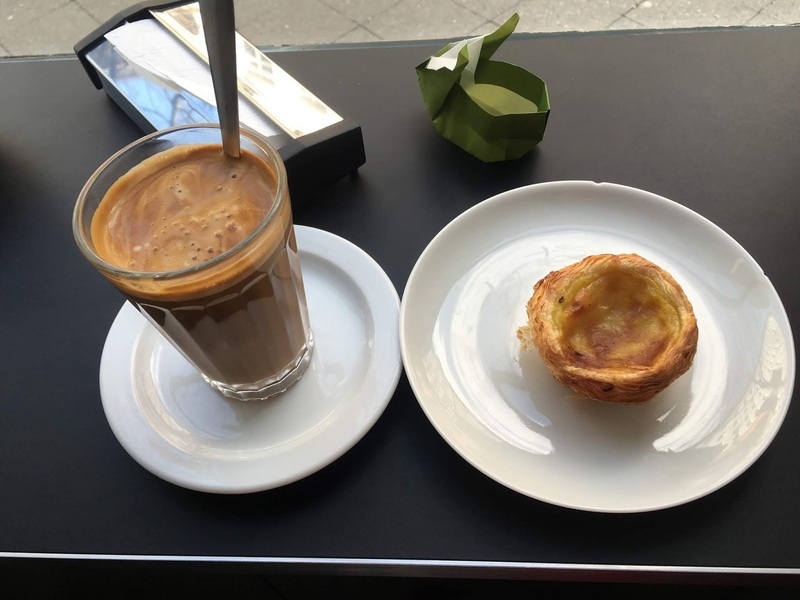 They serve the best decaf coffee I've ever experienced, but they also serve your regular caffeinated brown bean juice too, as well as vegan pastel de nata Portuguese tarts, their namesake. Vegan!!! This place was an absolute delight, with cool music, a friendly barista, and sweet little window seats where you could watch the day-to-day world of Berlin pass you by. The woman across the street dropped a basket out of her second-floor window on a pulley so a man street-level could pass up her groceries. This stuff actually happens in real life. Asian cuisine and Vietnamese coffee. I've never heard of a coffee and rice bar before, but what could go wrong? We experienced a lot of fantastic Asian food in Berlin, with Royals and Rice being a standout find. We only went in the evening so didn't get to try any of their coffee, but the food was bloody marvellous. Alongside sushi, they serve a wide-variety of tofu-based dishes, including the ever-enjoyable steamed bao bun and sweet potato curries. There's a huge amount of seating room and the staff are very friendly. We even considered going here twice because the food was so delicious. Try the bao buns if you're feeling indecisive! If you're into waffles, this is the place for you. Located in BIKINI BERLIN (it's a sort of of shopping centre, but with a pop-up food market, and lots of slightly-alternative clothing stores), it's run by a South African duo who have a knack for making the best crepes and waffles you'll ever taste. Each dish is topped with more delicious items than you can imagine, but with flavours that compliment one another and don't overwhelm. The man who served us was ridiculously friendly, so it's also a lovely place to visit if you also want a good chat about the world, as he was very well-travelled and had some fantastic advice about the many countries he'd lived in. Also located in BIKINI BERLIN, this is where I fell in love with the Hawaiian poke bowl. A poke bowl is a delicious combination of rice, fish (if you're a fish-eater), edamame, avocado, seeds, sweet potato...anything you could imagine, with a very strong Japanese influence, as with a lot of Hawaiian cuisine. These are such fresh and healthy dishes, but also incredibly filling - I wish I could have had more than one! There's options for veggies and vegans, all perfectly-seasoned and beautifully presented. We've already attempted to recreate one of these at home, but the way they cook their sweet potato will forever remain a mystery. Find yourself a poke bowl ASAP! You will never understand how long it took me to find the name of this bakery we stumbled upon one day on our way to the East Side Gallery for breakfast. I had to retrace our steps on Google Maps despite not knowing the route we walked to the Gallery at all, trying to find a tiny bakery located under one of Berlin's numerous U-Bahn stations. Nevertheless, I'm now happy to report that Salut Backwaren is the name of the bakery that served the most beautiful and delicious pastries I've ever experienced. I still don't know what I had for breakfast that day; all I remember was that I want more. There are pastries for every diet and palate, so dive in and discover something totally new on your way to some top-notch Berlin culture. When we first got into the centre of Berlin, we were starving and needed somewhere to pass the time before checking into the hotel. This is when we stumbled upon dean&david, a chain of cafes in Germany (as well as Austria and Switzerland) that serve brilliant toasted sandwiches, salads, and, my new true love, matcha lattes. Their food is affordable, fresh, and there's something suited for all diets, plus they are located all over the city centre, so it's easy to find one on your route to somewhere exciting. I've tried matcha lattes since and none of them live up to the dean&david standard, made with soya milk and maple syrup to sweeten. My best advice would be to stay away from the ones right in the centre, like Potsdamer Platz, around lunchtime as they seem to be everyone's number one choice! Our personal favourite was on Nürnberger Straße, right near our hotel. Watch this space, and also enjoy this photo from my trip to Berlin in April. It's been a hot minute, but we'll get into that another day. Hello! And thank you all for taking the time to answer some of my questions. First of all, can you each introduce yourself and what you do? 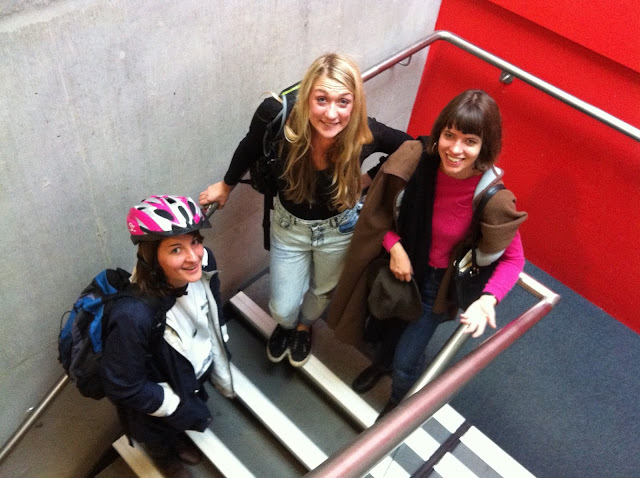 A: We’re Anna, Grace, and Eleanor and we work as a documentary filmmaking trio called Glow in the Dark Films. 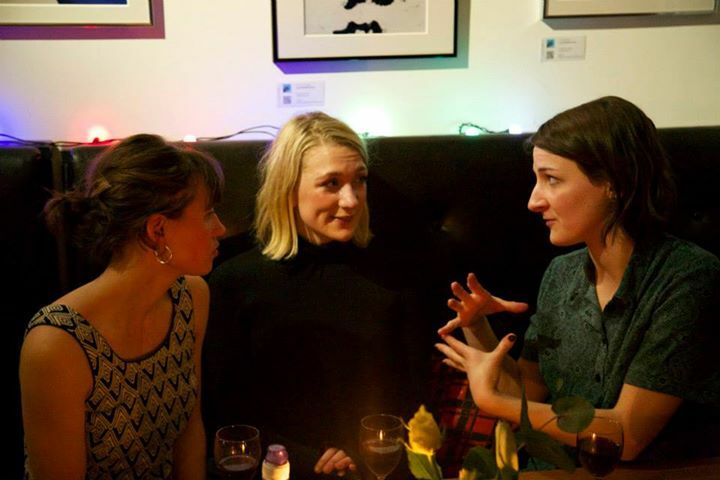 When and why did you choose to form your filmmaking collective? A: We met at the National Film and Television School in 2013, and joined forces after graduating. We found it was easier to navigate the world of freelance work together. G: And making documentaries can be quite solitary, and when you’re doing it alongside close friends it becomes more fun! Why the name ‘Glow in the Dark’? E: Films glow in the cinema, and also it was a warm-sounding name which captures the way we approach filmmaking. I know you all work in documentary film, but how would you each describe your individual filmmaking styles in three words? A: Understanding outsiders, prioritising allowing privileged moments of insight to unfold on camera. E: People-watching, sometimes with animals too. G: Hanging out with cameras. What are each of your filmmaking backgrounds? What drew you to the documentary film genre? A: I did Media Arts at university, where I randomly decided to take a documentary module. I fell in love with documentaries, both making and studying. After graduating, I did a 6 month filmmaking residency at the BFI before starting film school. E: I had no idea documentary making could be a job, but borrowed a small video camera while I was on my year abroad in Paris, and got completely hooked, spending days wandering the streets filming things I came across. I loved capturing those little accidental moments. G: I worked as a video journalist/blogger and camera operator, and found myself being introduced to amazing people with incredible stories that I knew could be something more than what I was doing. I’d watched more Buffy the Vampire Slayer than Maysles Brothers when I was growing up so had no idea about the creative possibilities of documentary, but my boss at the time started showing me documentaries and told me about the National Film School and that’s how it all started! When you started sharing your work with those around you, did you have to overcome any self-confidence barriers in order to get to that place? A: It was really helpful to begin making films in academic environments – it meant that my audience size grew slowly – from classrooms, to lecture theatres, to cinemas and online releases. E: I’m with Anna: film school did help with that. You get forced to show films, even at a rough stage to people, making it easier to overcome that kind of anxiety. G: I agree with both Anna and Eleanor, but in another way I think self-doubt is normal and probably for me will be there forever. Each new film feels like starting again with all the self-doubt that is normal when you care about something, and that first time you show your work to someone is always terrifying. What advice would you give to female filmmakers attempting to start out in the industry? A: Follow your instincts, make films about things you find interesting and keep going. Don’t try and be the person you think you should be, or make the films you think people want. That never works. G: Totally! And also surround yourself with people you like and who you want to support and will support you. Filmmaking can become all encompassing, so you want to make sure you enjoy it. What are some risks you’ve had to take with your career in order to get to where you are today? A: Investing time and money in ideas to film some footage before any funders have shown interest. It usually works out! E: Every film you start is a risk as there’s no safe way to get commissioned, but you just have to keep at it and try not to doubt. If you’re interested in something, you can make others interested too. G: Another risk is that there are always many different routes you can take, and sometimes it's hard to know what’s the best one. It can feel risky to follow your instincts, but it always ends up being the best option. Do you have a particular way of ‘getting in the zone’ when working? Like, a hot cup of coffee, some calming music? A: Breaking down my list of things to do into manageable chunks each day. It means that I can just focus on the task in hand instead of feeling overwhelmed. E: Having a little place to work, with things that inspire you on the walls. And tea. Lots of tea. G: A walk to the studio and lots of music. Lots of Whitney Houston and En Vogue right now. A: I find it incredibly helpful to talk to colleagues and friends about your project, and show some footage. They can give fresh insight, good advice, and encouragement! I also find that treating my personal projects the same as my commercial projects (paying people to help me out, sticking to schedules and budgets) helps me to take them seriously. E: I read things, watch things, and try not to get too frustrated with myself. G: We all rarely let ourselves do this, but I know when I do it’s the thing that makes the biggest difference – taking a break. I always return after a break with new perspective and more clarity. Are there any female filmmakers currently that strike you as changing the way films are made about women/starring women in lead roles? Are there any that are using film, for example, in ways that accurately express female sexuality? A: I really enjoyed Andrea Arnold’s American Honey. It follows a teenage girl called Star as she travels America with a bunch of kids selling magazines. 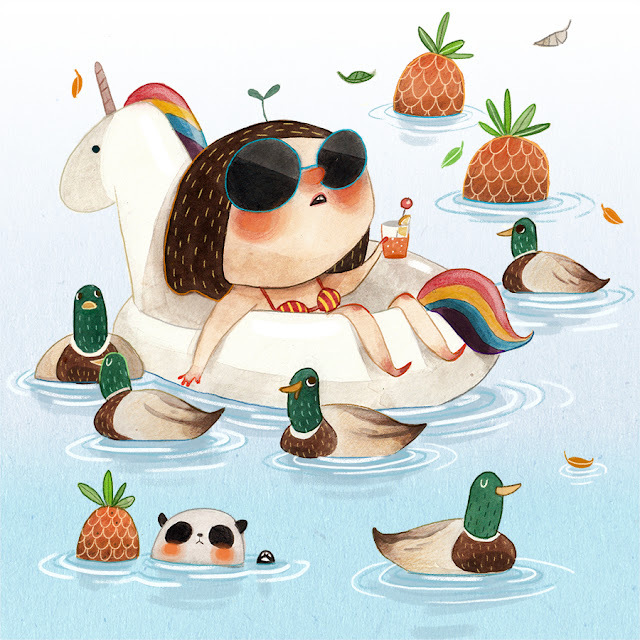 It captures what it feels like to be a young female discovering the world. Also Maren Ade’s film Toni Erdmann, which explores a father/daughter relationship. I like how complex the daughter Ines is. A lot of films create a simplistic female role that exists in relation to a male character, but Ines is full and complicated person - likeable and dislikeable, strong and weak. E: Chantal Ackerman is incredible, and so is Agnes Varda. Their female protagonists are women who refuse to fit into the box society has made for them. G: Crystal Moselle who made The Wolfpack has made some beautiful shorts with young female skateboarders and dancers that gives a totally realistic perspective on female sexuality, and of course Celine Sciamma with Girlhood – that scene when they are singing Diamonds all together is one of the most personally recognisable scenes I’ve seen in recent cinema. But I’d love any recommendations on this, I love seeing films that accurately express female sexuality! Can you recommend everyone reading a book you’ve enjoyed recently, as well as a film and an album or song? A: I’ve recently finished Confederacy of Dunces, by John Kennedy Toole, which I really enjoyed. E: There’s a book I’m reading called I’m Supposed to Protect You from All This by Nadja Spiegelman about three generations of women, which captures the complexities of mother-daughter relationships. G: I’m currently reading a novel called the Art of Joy by Goliarda Sapienza which is actually about a female seductress! And it’s great. And listening to the new War on Drugs album which is wonderful. And I haven’t sat down and watched a film in a while because while I’m shooting I often don’t actually watch films, but I’m really excited about A Ghost Story which is coming out soon. Is there anything else you would like to say before we finish? How can people find out more about you all and your work? What’s on the horizon for Glow in the next few months? A: We’ve all been working on independent projects over the summer, which will be released in the new year. Our website is www.glow-films.com or you can follow us on Twitter or Instagram. G: Thank you for asking us the questions, it’s been really fun to think about this!